This design is now on display at the Vermont Factory, take the tour, see how they are made and walk into a huge display yard including a 20×30 Timber Frame. The Two-Bay Garage is a large post and beam model that comes with design options to create a functional space to suit a variety of needs. 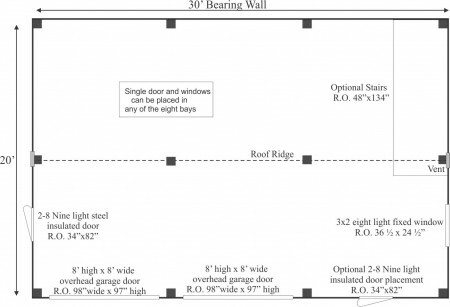 This versatile frame can be set up for cold storage, as a two or three bay garage, as living quarters, as a livestock barn or any combination of. The frame set up as a cabin is a favorite as a 1,200 square foot tiny house. As a Two-Bay Garage, the space creates room for your cars and workshop. The Two-Bay Garage can shelter horses, cows, goats, and sheep with enough room for tack and grain while the standard full loft makes great hay storage. Purchase the Two Bay Garage in three different forms. As do-it-yourself plans, as a complete precut kit (PCK) where all materials are color coded, part numbered and stacked in order, or as a fully assembled project (FA). FA projects ship in the north east USA. Display sell offs can be found here. The Two Bay Garage comes with a pressure treated sill plate. The floor system add-on includes 2x10 Hemlock joists 24" on center with 3/4" CDX plywood decking. Engineered Plans $3,500 Plans can be revised to meet your local codes on an hourly rate of $300/hr. The 20×30 barn is a large post and beam model that comes with design options to create a functional space to suit a variety of needs. This versatile frame can be set up for cold storage, as a two or three bay garage, as living quarters, as a livestock barn or any combination of. The frame set up as a cabin is a favorite as a 1,200 square foot tiny house. As a Two Bay Garage, the space creates room for your cars and workshop. The 20×30 Barn can shelter horses, cows, goats, and sheep with enough room for tack and grain while the standard full loft makes great hay storage. Designed to meet tough building standards, our 20×30 Post and Beam Barn Kits feature heavy 8×8 post and beams supporting a full loft and a steep 8/12 pitch gable roof. The timber frame offers endless possibilities for customizations. Optional dormers in the loft can provide light and additional space. The kit also comes with a choice of 8’ or 10’ first floor ceiling heights to allow either more room on the first floor or in the loft. Shed roof overhangs ranging from 4’ to 12’ wide on any or all of the exterior walls can accommodate simple firewood storage, create additional interior square footage, or open covered space. The 20×30 Timber Frame barn kit for sale is our most customizable and expandable design, all at a great, affordable price. Multiple siding and roofing options ensure your 20×30 frame can match existing buildings on your property. Consider adding a complete insulation package to turn this quality post and beam barn for sale into a cozy four season cottage. The 8×8 post and beam frame allows for space to easily install thick insulation with high R-values. The 20×30 Post and Beam Barn Kits feature locally sourced, beefy 8×8 hemlock post and beam construction with true mortise and tenon joinery. All of the necessary oak pegs, fastening materials, insulated windows and doors, and Step-by-Step do it yourself plans are included.Rugged post and beam techniques, passed down through the centuries, are used to construct this versatile design, reminiscent of old New England. All of our wood sheds, storage sheds, outdoor storage sheds, garden sheds, storage shed kits, cottages and utility enclosures are built of the finest Vermont lumber and handcrafted for long life and durability. New England weather can really put a wood garden shed or cottage to the test, and Jamaica Cottage Shop’s products have proven to stand the test of time and strength.